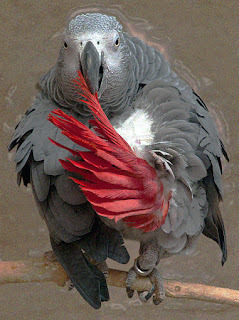 the other, a battered old parrot. One is silent, the other never stops talking. One of my favorite characters in this story is Victor: an African Gray Parrot. Touchy, loud, secretive, funny, smart, magical, annoying and lovable. But can he keep a secret? Art through needlepoint tapestry is also an important part of my character Addy's healing. The work below was done by an older teen close to me, when she suffered from a lengthy battle with agoraphobia and panic anxiety disorder. The work kept her focused and grounded - and played a huge part in her own healing. 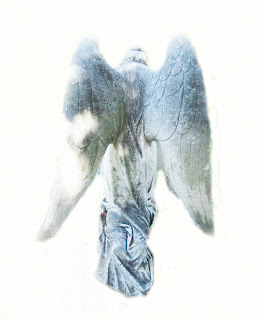 For more NEW photos and information on this supernatural novel about healing and growth, go to Ebooks or to the "tab" for "Angels Turn Their Backs" on my Home Page. I love seeing images from books I've enjoyed! That's a gorgeous tapestry. She did many more and I have three on my walls. Her work IS just beautiful. Like you, I love to see images from books. I always "see" my characters as I create them - and I am presently working on small drawings of some of my favourite characters from "The Watcher's Quest Trilogy" fantasies - which I hope to post eventually.